This document summarizes the history of the development and use of fire-resistant plywood roof sheathing in the U.S. and explains the issue of structural damage to roof sheathing where fire retardant plywood roof sheathing, or FRT plywood was used on buildings. Bottom line: FRT-treated material can degrade seriously due simply to high attic temperatures. Special inspection and testing methods are available. 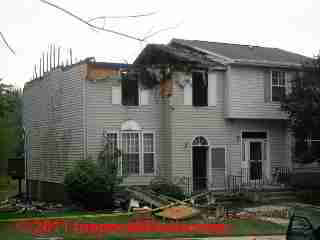 The cost to remove and replace FRT plywood roof sheathing was significant. In addition, FRT plywood roofed buildings apparently did not receive the fire-spread resistance that was intended. FRT or flame resistant plywood is (or was) required by building codes for certain structures such as on either side of the fire wall between building units in multiple-living unit structures (apartments, condos, townhouses). In the U.S. including in your state of New Jersey FRT plywood roof sheathing products began to be widely used during the late 1970s and early 1980s (Barbel 1992), mostly in homes east of the Mississippi, and was used in construction up to 1988 (Kryakos 1994) or possibly a bit later. FRT deterioration problems were first "discovered" in New Jersey around 1987 and were found throughout the U.S. wherever FRT plywood was used in roof construction. The FRT deterioration problem was widely investigated by experts as you'll see in citations given at the end of this article, and was addressed by ASTM and other standards associations in North America. FRT plywood was intended to deteriorate in response to a fire at around 400F by charring to retard flame spread. The effectiveness of the fire-resistant roof sheathing also was called into question. Our photo (left) shows the success of FRT plywood in preventing fire spread from one portion of a flaming building to the next. As a substitute for vertical through-roof firewalls on multiple-dwelling buildings, the advent of FRT-plywood permitted omission of those more costly fire-walls that had to be built up extending through roof design. The omission of that vertical through-roof extension simplified building roof construction thus reducing building cost as well as re-roofing costs. Watch out: when inspecting a building for the presence of FRT plywood, look first at the roof sheathing from the attic or under-roof space. If you suspect or confirm that FRT plywood is in place on the roof, do not walk on that roof area as weakened plywood roof sheathing could give way, resulting in both roof damage and severe injury. Where will Fire Retardant Treated Plywood be found on buildings? 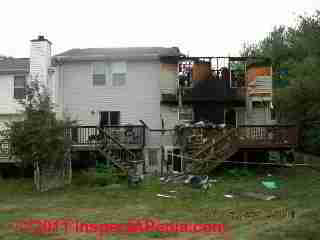 On entry into the attic space of a multiple-dwelling structure such as attached town homes or condominiums, look first for the fire-wall that should have been built between the abutting units. In proper modern construction that firewall should extend from the foundation up through the occupied space and up through the attic space to at least the roof surface. In that design, typically FRT plywood roof decking was used for four feet on either side of the firewall between building sections, and the firewall terminated just below the roof decking. You can see that design in the photo below. The concrete block wall on the left of the photo is the fire-wall, and you can see that the plywood roof sheathing adjacent to the fire-wall looks different (like plywood) than the remaining roof sheathing (that is OSB in the right portion of the photo). In more recent construction as well as in retrofit jobs intended to improve building fire safety you may see a double layer of fire-resistant drywall installed for as much as four feet against the roof sheathing on either side of the party wall or fire-wall between adjacent living units. But on older buildings where FRT plywood was used, attic heat and age was found to lead to deteriorated roof decks even where no actual fire had ever occurred. Apparently the fire resistive treatment, intended to lead to a "surface charring" of the plywood to slow flame spread, also led to surface oxidation and deterioration. Often structural repairs will be required. While FRT plywood seemed as if it was going to be a terrific product, it appears that high attic temperatures in some buildings caused early deterioration of the material. In some cases the plywood became so soft that someone walking on the roof could simply step right through it. The material, as it was formulated in its problematic form, is no longer used in new construction but may still be found on some buildings. fire-resistant drywall laminated on the under-side of the roof sheathing on either side of the wall. Where these products and designs were used FRT plywood may have not been required. The following is adapted with permission from an original Fire-Retardant-Treated (FRT) Plywood article in Professional Roofing by Tom Bollnow, Professional Roofing, May 1999 p.62. Q: Have there been any significant efforts made to eliminate premature degradation of fire-retardant-treated (FRT) plywood used as roof decks? A. During the late 1980s, there was an outbreak of structural roof deck failures directly related to degradation of FRT plywood used as roof sheathing. Because the potential for FRT ply- wood degradation still exists, roofing professionals should be knowledgeable about FRT plywood properties so the likelihood of degradation occurring can be reduced. FRT plywood is produced by pressure treating plywood with fire retardant chemicals. During the mid 1980s, the search for lower hygroscopic (i.e., less moisture-absorbing) chemical compounds to treat plywood resulted in a change from ammonium sulfates that cause fastener corrosion to ammonium phosphate salts. Ammonium phosphate salts with additional treatments using buffers, such as Borax, and organic and less acidic chemicals were developed to decrease fastener corrosion and raise the threshold temperatures of fire-retardant materials. FRT plywood's structural strength changes from 10 percent to 20 percent after an initial pressure treatment procedure. The drying process follows the pressure treatment procedure and is critical to achieving maximum product performance. Problems result if the kiln drying process is accelerated. Air drying causes fewer problems, but it is more time-consuming. Products should be marked "KDAT" if kiln dried after treatment or "ADAT" if air dried after treatment. FRT plywood treatments are divided into three categories: Exterior, Interior Type A and Interior Type B. A roof deck typically will be interior Type A because it is not exposed directly to outside elements. Type B treatments can cause excessive moisture to accumulate in wood, allowing chemicals to react with steel fasteners and connectors. Building code authorities, such as the Building Officials and Code Administrators (BOCA) International Inc., have specific requirements for treatment processes and labeling. For example, plywood must be manufactured according to American Wood Preservers Association (AWPA) standards, and the treatment process must be evaluated by BOCA Evaluation Services, National Evaluation Services or an AWPA-approved, independent agency. In addition, each plywood piece must be labeled properly with its performance rating and design-strength adjustment values. FRT plywood must be used according to manufacturers' recommendations. It must be kept dry and used strictly within the parameters of design-load values. Open flames' elevated temperatures activate fire-retardant chemicals that produce. low-level acids (i.e., acid hydrolysis) in FRT plywood. The acids lower the temperature at which thermal degradation occurs, increase the amount of surface char and reduce the production of flammable volatiles (i.e., by-product gases that contribute to flame spread). The results are a reduction of the flame spread across a surface and capacity to support combustion. When a flame is removed from FRT plywood's surface, the plywood will char but not burst into flames. Chemicals that produce low-level acids causing fire-retardant effects also cause premature FRT plywood degradation at lower temperatures. Untreated plywood experiences no major problems at temperatures up to 200 F (93 Q. Roofing professionals should note that achieving fire retardancy at the expense of structural integrity is not desirable. Acid hydrolysis and degradation can occur at lower elevated temperatures of about 130 F (54 C to 180 F (82 Q. Temperatures at the interface surface between a roof covering and deck can reach 200 F (93 X with 150 F (66 C commonly found. As a result, degradation can occur at temperatures that are below open flame temperatures. Roofing professionals should note that there are construction alternatives available that can eliminate the use of FRT plywood. But local codes (e.g., fire, building) first must be referenced to be sure the alternative construction is in compliance. These options include fully sprinkled interior systems; noncombustible decks; %-inch- (16-mm-) thick water- and fire-resistant gypsum board beneath untreated plywood; and fire walls that extend through a roof system on a multi tenant building (e.g., an apartment complex). If FRT plywood is installed new or encountered during a recover situation, the use of light-colored shingles, a radiant-reflecting roof covering (e.g., white single-ply) or improved ventilation may diminish potential degradation. These materials may lower temperatures at a roof deck's surface. Roofing professionals should use caution and precise documentation when confronted with FRT plywood roof decks to avoid repercussions if failures occur. -- Original Source: Page 62 Professional Roofing May 1999. Photograph, adaptation, edits and additions by Daniel Friedman. Fire retardant treated FRT plywood, while it is still a combustible material, has been chemically treated to provide a lower flame-spread rate than un-treated plywood used in building construction. Our second photo of a contained spread of fire (left) illustrates the object of using this fire resistant roof sheathing. The plywood industry states that the flame-spread rate of FRT plywood is at least as low as gypsum wallboard (although without specifying which fire-rated wallboard was used for comparison). 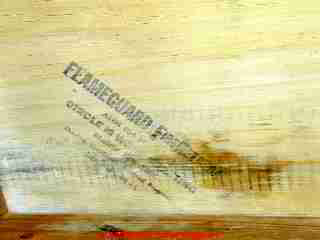 A Fire-Retardant-Treated backboard will be designated with a fire-rated stamp “branded” or “stamped” along the edge or center of the plywood—“UL FR-S Plywood 1780 R-7003.” Marine-grade plywood does NOT qualify even though it is saline “treated”—as it will have a different UL number. According to the APA, and in accordance with the International Building Code (IBC), noncombustible buildings Types I and II (usually built of steel and concrete), allow fire-retardant-treated plywood and heavy timber construction in limited uses. In buildings type IIIA and IV (less fire resistant than Types I and II), interior walls, floors, and roofs may be built of conventional, untreated wood. Non-combustible exterior walls (required for building types IIIA and IV) are required however. The IBC permits FRT wood for these exterior walls as a design option. IBC building type V (conventional wood frame buildings) have the lowest fire resistance and are the least costly to construct. Type V buildings may be constructed using conventional un-treated wood throughout the structure. However the sue of fire sprinkler systems, fire spacings (set-backs), and fire-resistant-rated walls, floors, and roofs, are required to obtain larger interior spaces. For a detailed, industry-provided and current description of Fire Retardant Treated FRT Plywood, see Fire-Retardant-Treated (FRT) Plywood, American Plywood Association (APA), representing the engineered wood industry, publication NO. K320, January 2009. This document includes the types of construction where FRT plywood is used, specifies the proper type of fasteners used for FRT plywood, describes the burn-through resistance and design capacities of FRT wood, provides the FRT plywood treating process and test standards, outlines code-approved applications for FRT Plywood, and explains how to identify fire-retardant treated plywood. -- thanks to Arlene Puentes for assistance with this material. Reader Question: when were building fire walls first required in homes? Firewalls are a modern building safety feature used in multiple occupancy dwellings. E.g. see historical citations given in the references below. ANSI/UL 263, Standard for Fire Tests of Building Construction and Materials, Underwriters Laboratories Inc., 2003. ANSI/UL 723, Standard for Test for Surface Burning Characteristics of Building Materials, 2003, Revised 2005. ASTM 1987, Section 4, Construction, Vol. 4.09, Wood. ASTM D-198-84, ASTM D-271j8-76, ASTM D-2719-76, ASTM D-2898-81, ASTM D-3043-76, ASTM D-3044-76, ASTM D-3201-86, ASTM D-3500-76, ASTM D-3501-76, ASTM D-4671-88, Op. Cit. Excerpts: House Joint Resolution No. 238 passed by the 1992 General Assembly directed the Department of Housing and Community Development to examine and report on a number of issues associated with the use of fire-retardant treated CFRT) plywood. This study on the premature deterioration of fire-retardant treated plywood used as roof sheathing was conducted by the Department of Housing and Community Development in response to House Joint Resolution 238 of the 1992 General Assembly. The study requested the Department to develop a particular protocol to determine the structural characteristics and durability of the products and to give consideration as to whether a separate five-year warranty period should be enacted. This paper examines these National Fire Protection Association (NFPA) codes and their referenced standards. It specifically addresses how fire-retardant-treated wood (FRTW) can be used in building construction and examines a few case histories demonstrating the use of FRTW in lieu of noncombustible building elements. Gosselin, Guy C. Structural Fire Protection: Predictive Methods. Institute for Research in Construction, National Research Council of Canada, 1987. Gosselin, Guy Charles, and Tiam Tjoan Lie. Provision of Fire Resistance: Evolution of Design Approaches. Vol. 1. National Research Council Canada, Institute for Research in Construction, 1987. Langenbach, R. "Better than Steel? (Part 2): Tall Wooden Factories and the Invention of “Slow-burning” Heavy Timber Construction." Structures and Architecture: New concepts, applications and challenges (2013): 122. Excerpt: FRT plywood ended up on the roofs of thousands of condominiums and town houses built between 1976 and 1988, mostly east of the Mississippi. For certain applications, building codes and insurance companies permit fireretardant-treated wood to be used as an alternative to noncombustible materials. Fire retardants drastically reduce the rate at which flames travel across the wood surface, thereby reducing the capacity of the wood to contribute to a fire. In some situations, the use of fire-retardant-treated (FRT) plywood as roof sheathing has resulted in a problem: the wood loses strength through thermal degradation. Although available information indicates that the frequency at which this problem occurs is low in relation to the volume of FRT material in use, it also indicates that significant degradation can occur with some fireretardant-treatment formulations, in specific installations, and under the right conditions. The combination of elevated temperatures caused by solar radiation, type of fire retardant chemicals, and moisture can prematurely activate the fire retardant to do what it is designed to do: lower the temperature at which thermal degradation occurs, thereby increasing the char and reducing the production of flammable volatiles. These chemical changes, which occur at temperatures lower than those at the roof covering-sheathing interface, are responsible for the strength degradation of FRT plywood used as roof sheathing. LeVan, Susan L. "Chemistry of fire retardancy." Advances in chemistry series (1984). LeVan, Susan L. "Chemistry of fire retardancy." in Chemistry of Solid Wood, Rowell, Chapter 4, Series 207, Roger M. (ed), American Chemical Society, Washington D.C.
Generally, Joseph Louis Gay-Lussac is credited with the development of fire retardants for wood when in 1820 he proposed treatments with ammonium phosphates and borax. ... These standards have given specifiers the needed confidence to again use fire retardant treated wood. In a definitive series of reports from 1930 to 1935, researchers at the USDA Forest Products Laboratory (FPL) investigated about 130 different inorganic fire retardant formulations. They found that diammonium phosphate was the most effective for reducing flame spread while monoammonium phosphate, ammonium chloride, ammonium sulfate, borax and zinc chloride were also active. However, many of the tested chemicals were later found to also have associated problems of high cost, corrosion, hygroscopicity, strength reduction or glow promotion. Therefore, other approaches were needed. By the 1950s, there were several formulations in commercial use for pressure treating wood. (Fire retardant coatings were also being investigated, but their acceptance and regulation lagged behind that of pressure-treated products.) All of these formulations were inorganic combinations blended to achieve a reasonable compromise of cost and acceptable performance. By the 1960s, three formulations became dominant and were used extensively for interior purposes for the next 20 years. Exterior formulations were introduced in the late 1960s for protection of products such as shingles, shakes, siding or scaffold planking that are exposed to the elements. These systems were based on a different chemistry in that polymers were formed within the wood. The polymers encapsulated the other fire retardant ingredients and rendered them leach resistant. The use of fire retardants climbed very slowly in the United States until the 1960s (Figure 1). Then from 1960 to 1970, the use quadrupled as there was an increased awareness of the considerable safety benefits of fire retardants. However, the emergence of corrosion, hygroscopicity and strength problems began to plague the industry and the market grew only slightly until 1980. The market suffered a downturn through the early 1980s even though building code changes were being implemented that opened up new uses for fire retardant treated wood. In the early 1980s, second-generation fire retardants were introduced to address the corrosion and hygroscopicity problems of the first generation inorganic formulations. These second-generation products were of two types. One formulation blended a nitrogen-phosphorus organic compound with boric acid. The other second-generation formulations were based on ammonium polyphosphates with or without various additives in small quantities. The additives included boric acid, borax, moldicides and others that augmented their performance. With the introduction of the second-generation products, there was concern on the part of designers and specifiers that the generic strength reductions used for the previous fire retardants would no longer be applicable to the new products. Accordingly, in 1984, the National Design Specification for lumber was revised to require that the fire retardant producers supply design reduction factors and in 1986, a testing protocol for matched treated and untreated lumber was issued to determine NDS values. In 1987, the Plywood Design Specification was similarly revised to require design values from the producers but no testing protocol was specified. In the course of development of the NDS test protocol, it was suggested that elevated temperature testing be included but the protocol did not require such testing. Thus, in the late 1980s, there was no accepted protocol for testing either lumber or plywood at elevated temperatures. In the 1950s and ’60s, FPL researchers had shown that elevated temperatures and humidities can impact wood strength but their work was generally done at temperatures that seemed far above those occurring in structures. However, in the late 1980s, reports began to surface that some of the second-generation formulations were experiencing strength loss in high temperature applications such as roof sheathing. After the initial concern that all second-generation products were involved, it was found that problems were occurring with only some formulations. Litigation ensued and further investigations revealed that high humidity conditions frequently existed in problem installations. Numerous causes were alleged for the strength problems and the end result was that the overall market for fire retardants was severely impacted. An ASTM task force quickly developed a test protocol based on the FPL report and submitted it to D07 for consideration as an emergency standard. In late 1991, the test protocol was accepted as ES 20, Test Method for Evaluating the Mechanical Properties of Fire-Retardant Treated Softwood Plywood Exposed to Elevated Temperatures. This protocol eventually became D 5516, Test Method for Evaluating the Flexural Properties of Fire-Retardant Treated Softwood Plywood Exposed to Elevated Temperatures. These tests were developed under the ASTM consensus process by government, academic and industry researchers and quickly adopted by building codes and other regulators. The result is that several products are currently available that give excellent strength performance. In fact, new fire retardants entering the market essentially undergo testing by the above methods prior to acceptance into the stream of commerce. The ASTM process helped restore market stability and substantial growth in fire retardants has occurred in the last decade. NFPA 220, Standard on Types of Construction, 2009 edition. NFPA 221, Standard for High Challenge Fire Walls, Fire Walls, and Fire Barrier Walls, 2009 edition. NFPA 251, Standard Method of Tests of Fire Resistance of Building Construction and Materials, 2006 edition. NFPA 255, Standard Method of Test of Surface Burning Characteristics of Building Materials, 2006 edition. NFPA 703, Standard for Fire Retardant – Treated Wood and Fire-Retardant Coatings for Building Materials, 2009 edition. NFPA 5000, Building Construction and Safety Code, 2009 edition. NFPA, National design specifications for wood construction, 1986, NFPA, Washington D.C.
A fire-retardant plywood that has become a standard building material in town house developments in the last decade has now been found to decompose after only a few years, leaving homeowners and builders with leaky and unsafe roofs and large repair bills. The plywood, called F.R.T.P., for fire resistant treated plywood, has been used in the roofs of a million housing units east of the Mississippi, according to the National Association of Home Builders. Since the problems were first discovered in New Jersey several years ago, scores of lawsuits have been filed against makers, suppliers and insurers. ...One plaintiff in the suits is Millponds, a 400-unit town house development in Marlboro Township, N.J., where all of the fire-retardant parts of its roofs are in various stages of decay, said the homeowner's association's lawyer, E. Richard Kennedy. Mr. Kennedy is credited with having first traced the problem to the wood itself in 1987. Heat built up on roofs by the sun - at temperatures as low as 150 degrees Fahrenheit - sets off the fire-stopping acidic reaction that the wood's designers intended to happen only at the temperatures of an actual house fire, about 400 degrees. The heat and chemicals attack the cellular structure of the wood, causing it to weaken. Shafizadeh, F., "Pyrolysis and combustion" in Chemistry of Solid Wood, Series 207, Chapter 13, Rowell, Roger M. (ed), American Chemical Society, Washington D.C.
Builders primarily used the fire-resistant treated plywood in town houses during the housing boom of the early 1980s, said Bill Young, the consumer affairs director for the National Association of Home Builders. Builders in other parts of the nation used a code that had not yet permitted use of the treated plywood, also known as FRTP, he said. Dynamic thermogravimetric analyses were conducted under vacuum on pyrolysis of wood, of alpha-cellulose, and of lignin, untreated and treated with 2 percent by weight of five inorganic salts. Data for weight loss and for rate of weight loss were obtained to indicate the principal decomposition ranges for the wood and the wood components, the effect of the chemicals on volatilization at various temperature ranges, and the kinetics of the decomposition reactions. Wang, Fengqiang, Qingwen Wang, and Xiangming Wang, PROGRESS IN RESEARCH ON FIRE RETARDANT–TREATED WOOD AND WOOD-BASED COMPOSITES: A CHINESE PERSPECTIVE [PDF] Forest Products Journal 60, no. 7 (2010): 668-678. Abstract: Research on fire retardant–treated wood and wood-based composites has been conducted in China for over two decades. Although many kinds of fire retardants for wood and wood-based composites have been studied, the focus is still mainly on compounds or mixtures containing phosphorus, nitrogen, and boron, which can be used in a water solution for solid wood impregnation. Fire-retardant treatment methods for wood-based panels are either pretreatment of veneers, fibers, particles, or strands before hot pressing or impregnation of waterproof panels with fire-retardant solutions. Though attempts have been made in laboratories and factories to mix the fire retardants with glues, it has proven very difficult to spray the glue smoothly and to deliver effective amounts of fire retardants during the manufacture of panels. The mechanisms of phosphorus–nitrogen–boron fire retardants have been investigated systematically. The results indicate that the phosphorus–nitrogen compounds and the boron compounds are highly synergistic in effective fire-retardant formulations. The catalytic charring effect of a fire retardant on wood is a key factor in its efficacy. A chemical fire-retardant mechanism for boric acid is also proposed. Research on fire retardants for wood–plastic composites has been attracting more attention in recent years; however, most results are preliminary because of the difficulty in identifying or formulating a fire-retardant system that is effective for both wood and plastics. Only preliminary research has been conducted on smoke suppression for wood; innovative efforts will be needed to conduct further research. For more information on Fire Retardant Treated (FRT) Wood, log onto our web site at bwaring@nexsenpruet.com The Bottom Line The hazards associated with the FRT problem are real and should not be overlooked by property managers, owners and others who have responsibility for building maintenance. If an inspection reveals the presence of FRT lumber or plywood sheathing, a complete structural analysis by a competent structural engineer should be undertaken to determine the extent of any damage and loss of integrity of the wood. If necessary, immediate steps should be taken to secure the structure from a safety standpoint. In extreme cases, the building may have to be vacated. Thereafter, an assessment can be undertaken to determine the manufacturer(s) of the particular FRT and a complete damages evaluation can be conducted. Oftentimes, litigation against the manufacturers and/or others involved in the construction of the project results. UL, Fire Resistance Directory, 2007 Underwriters Laboratories. Winandy, J. E. 2001. Thermal Degradation of Fire-Retardant-Treated Wood: Predicting Residual Service Life. Forest Prod. J. 51(2): 47-54.Winandy, J. E. 2001. Thermal Degradation of Fire-Retardant-Treated Wood: Predicting Residual Service Life. Forest Prod. J. 51(2): 47-54. Winandy, J.E., S.L. Levan, R.J. Ross, S.P. Hoffman and C.R. McIntyre. 1991. “Thermal Degradation of Fire-Retardant-Treated Plywood: Development and Evaluation of a Test Protocol,” Res. Pap. FPL-RP-501, U.S. Dept. of Agriculture, Forest Service, Forest Products Laboratory, p. 21. Window panes: long history of number of panes (larger = newer) but varies widely by geographic area and of course pane size varies also by sash dimensions. Continue reading at FIRE RATINGS for ROOF SURFACES or select a topic from closely-related articles below, or see our complete INDEX to RELATED ARTICLES below. 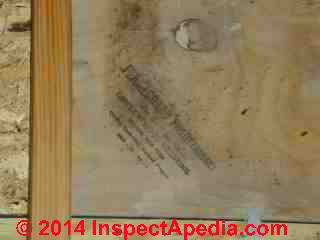 FIRE RETARDANT PLYWOOD at InspectApedia.com - online encyclopedia of building & environmental inspection, testing, diagnosis, repair, & problem prevention advice. I was told that a newer TH with OSB roof sheathing and no FRS plywood was OK because a sprinkler system is installed in the house. Sprinklers are not in the attic. Is this ok? Trying to educate my real estate due diligence staff on problematic fire retardant plywood. 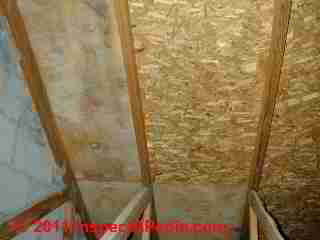 Need attic pictures showing the use and deterioration of the product. Can you direct me toward some pictures? 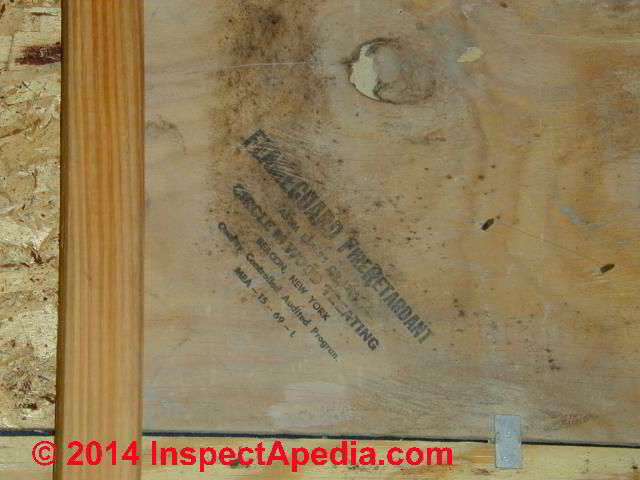 Eric, I've added another photo of the identifying stamp found on FRT plywood as it might be visible in an attic. Other photos of where the FRT plywood is likely to appear are shown in the article above. Clicking on any of our images will present an enlarged, sharp-focused copy. You are welcome to use printed copies of this article in a classroom presentation. Please also mention to your due diligence staff that we welcome questions (or content suggestions or criticism) and are happy to respond, research, or provide further information as needed.